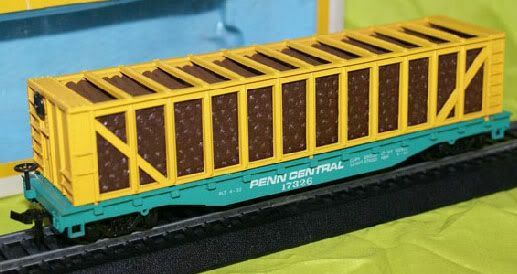 Known to have been included in a Georgia Pacific promotional train set offering, this car also makes appearances as a regular rolling stock item in Bachmann catalogs. This car, listed in the catalog as a 51' Pulpwood Rack Car with Log Load, is first found in the 1979 Bachmann catalog. Two roadnames, Penn Central and Santa Fe, are included in '79 and the car is listed at $3.00 each. A dealer assortment, item 1290, was available according to the catalog for this car.